Lloyd Alter at Treehugger posted a piece that challenges the current infatuation with density that is popular among urbanists these days. Part of the pro-density support stems from perceived environmental advantages of density realized through carbon emission reductions. In his piece, Alter argues that the Glaeserian approach to density--which is essentially all density is good, should be encouraged and a city of skyscrapers will be economically, culturally and environmentally beneficial-- is incomplete or wrong. Alter argues that transportation is a larger influence on emissions. 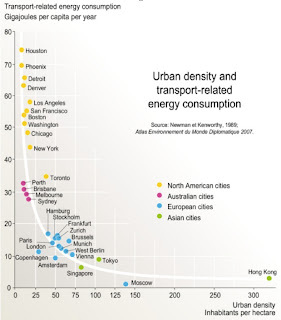 Glaeser, Owen, Alex Steffen and a lot of other people point to this now famous graph from UNEP, which plots energy consumption against density, to demonstrate that New York's density makes it greener than any place in America. Except it doesn't; New York in fact isn't dense at all (Manhattan is, but that is only one of five boroughs) it is just spiky, at 2050 people per square kilometer. Surprisingly, Los Angeles is denser, at 2750 people per square kilometer. Paris is 50% denser and it is pretty much six stories high throughout. In fact the more you look at this graph, the screwier it is. Sure you have Hong Kong at one end and Houston at the other, but in the middle nothing is clear. 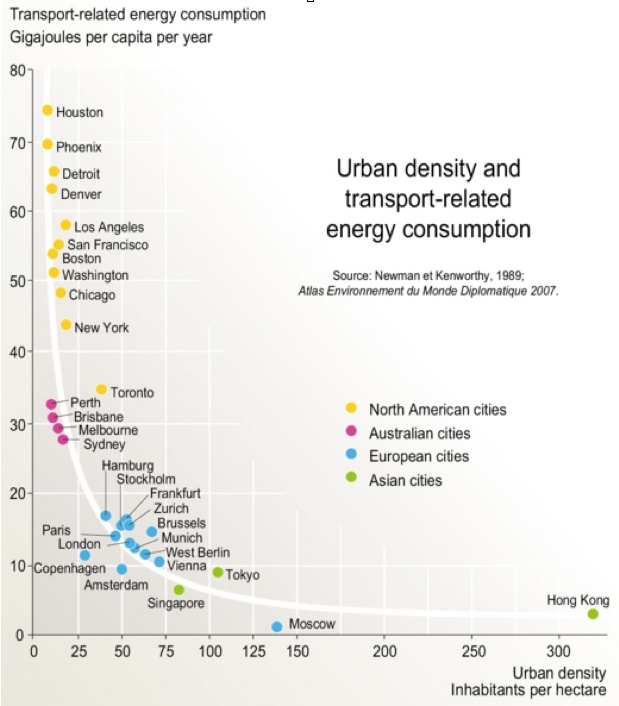 Teeny Australian cities are not dense at all but consume less energy per capita. Copenhagen is barely denser than New York and uses a quarter the energy per capita. The longer you look at it, the less convincing it is. Density is in my opinion, ends up being almost completely irrelevant. What matters is how you get around in your cities, not how tall the buildings are. Our road systems, our highways, all designed for one thing: to let people use a couple of tons of steel powered by a tankful of gasoline to move a few pounds of flesh between two points. And while it is true that people do this less in Manhattan than they do in Los Angeles, it has nothing to do with density and everything to do with walkability. For a while now, I've wondered if we have been mislabeling the development around well functioning transit stops as transit-oriented developments (TODs). This may seem odd, because numerous studies have shown that property values can increase by 20% to 40% percent around transit stops, particularly rail stations (although the increases are uneven). The beginnings of my skepticism began when I started looking at transit ridership at these stations. For example, a quick look at boardings at Dallas light rail stations finds little, if any, relationship between transit ridership and investment around the station (see slide 7). Arecent study (February 2011) of more than 200 TODs in California by the Public Policy Institute of California found no evidence that they boosted employment. (See also this study of Atlanta MARTA stations in the Journal of Urban Economics.) And, more tellingly, a survey of residents in Portland, Oregon by sociologist Bruce Podobnik at Lewis & Clark College found that residents of the New Urbanist TOD Orenco Station utilized transit more than conventional suburbs, but not any more than older Portland neighborhoods. In fact, most residents (two-thirds or more) continue to use their car to get to work rather than transit. Moreover, transit use has actually declined as a share of commuting trips in recent years (see Table 5). So, what explains the increase in property values? I believe it's the pedestrian access. The accessibility provided by density and mixed uses generates the value around these stations areas, not the transit access per se (and hence the mislabeling). In short, these stations areas are Pedestrian-Oriented Developments (PODs), not TODs. Indeed, Podobnik's survey of Orenco Station residents hints at this. In Table 5, 50 percent of survey respondents in Orenco said they walk to stores or shops five times a week or more (up from 11 percent five years earlier). What we are seeing, and what Alter suggests in his Treehugger piece, is that walkability is where we should be focusing our efforts. Density is fine but not necessary, and too much density may be undesirable for many people. Transit is nice but unlikely to be much more than a niche market in the US, at least the way transit agencies are organized now. Since no city pursues transit oriented development policies without the transit component, we don't really know if denser, walkable communities will work. But it is much cheaper to pursue Pedestrian Oriented Development than Transit Oriented Development or unlimited density development. There are additional benefits to POD. The largest one relates to planning and designing transit networks. Rather than the current approach of speculative transit construction in an attempt to lure new "choice" riders who will live in a new development in the future to commute by transit, we can re-orient out approach to improve transit in areas where people who will use it already are. Considering that commuting is about 20% of total travel, large investments focused on commute travel will have smaller potential environmental benefits than focusing on non-work travel. And the folks in the PODs are already reducing auto trips for non-work travel. The other main benefit to POD is that it is completely under local control to change the zoning code. Cities don't have to wait for uncertain state and federal subsidies to encourage pedestrian oriented developments. Shifting planning policy to pedestrian orientation can happen quickly (not that it will) and locally, and likely deliver large benefits at low cost. What's not to like? Should Chicago Get Kicked Out of Illinois?